Flat roofs are becoming more popular in the UK for a number of reasons including better energy efficiency and cheaper installation costs. Flat roofing is available for both domestic and commercial installations and they’re known as low pitched roofs. They’re often installed at a slight inclination to allow water to run off the top and into a guttering system. With the fantastic benefits flat roofs bring to properties, it’s extremely important to ensure they’re maintained to make the most from the advantages. With a flat roof you’ll not only be saving space, but money and energy too with an efficient structure. They’re also resistant to UV rays and the UK’s constantly changing weather conditions. 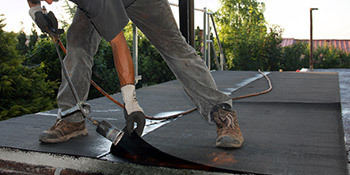 With a number of benefits over the pitched roof, flat roofing has become a popular addition to the UK market. If you’re interested in receiving up to four FREE quotes complete our quick form and hear from local, vetted and reputable companies. Project: Flat roof inspection. Possible repair. Guttering and fascia fitting. Maybe conversion to pitched if possible. Project: Roof 1500sq/m. 2 layers of felt.Price? Project: Felt roof on garage damage needs repair or replaced. Very good he explained everything to me,very impressed. He was very polite and helpful. quotatis co uk was very quick I needed some one to come around straight away as I had water coming from my ceiling.and need it to be done straight away,so it’s all water tight now,had a quote on Friday had the roof done on Saturday. The fact that you gave me a reputable firm who has completed the work to my satisfaction today, means I would recommend them to others.